Last week, the Digital Implementers Group, met at their regular six weekly meeting. A diverse group attended from various tiers of government to discuss E-approvals and associated challenges. Some members have already started the process and others want to learn more. The meeting started with the usual roundtable update of key projects and issues for the group. Most members were at various stages of system implementation, rollouts or consolidation. Some members focussed on Training and e-learning packages. There is a strong movement towards increasing the digital transition from paper processes. The importance of good governance was briefly emphasised. People have become increasingly mobile in today’s fast-paced world, yet the need for them to still be hands-on, in the process of approvals, within the business has not changed much. E-approvals would help to increase workflow efficiency and minimise delays across the business with the future ability to process approvals in real-time, from anywhere and at any time. We had two presentations on the rollout of an e-approval process. Organisation one started with a user base of 5% (around 20 people per business unit) and expanded to a critical mass after the e-approval workflow implementation. With the use of third party software, this organisation managed to ride on the back of a new Business Classification Project to make the staff aware of the importance of and the future implementation of e-approvals. This change management technique managed to filter to all key staff and helped to soften the negativity that often accompanies process change. Note: The organisation started functioning in the early 1900’s which means that it has an accumulation of tons of records and a variety of recordkeeping practices encompassing paper and electronic. Organisation two is fairly new and the CEO requested the Manager to stop the “Friday afternoon flapping” that was due to people not completing their approvals in time. The process of e-approvals began amidst the organisation’s rapid expansion and posed some very challenging lessons to be learnt. In order to gain access to the workflow, the users were encouraged to be trained in Records Management. This encouraged the uptake of the recordkeeping system. Both organisations received the authority of their CEO’s in order to proceed. This highlights the compliance statement in Records Standards 12 about Principle 1: Organisations take responsibility for records and information management. Staffing for these e-approvals projects have been limited to one staff member usually the Records Managers. Often organisations underestimate the volume of work that is generated by the change in workflows that accompany this process. Since the process is relatively new, staff need to be introduced to new technology, new processes and sometimes new mandates and responsibilities. Some of the benefits of the implementation are; approval time reduced by up to 2-4 weeks, lowered EA workload, more active participation in the process by approvers as they are now held accountable and fewer lost approval documents. There are no mobile devices solution for e-approvals being used by these organisations yet. 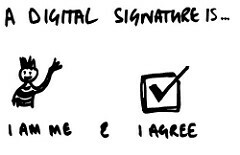 Some organisations still require wet signatures or physical signatures. Mobile device solution, KPI’s inbuilt into the process, review of the requirements for wet signatures and appropriate reporting on the process. The Digital Implementers Group will continue to meet throughout the year. State Records staff will continue to share summaries of the meetings, so look out for new blog posts! The next meeting date is 27 July 2016.